They will no longer treat their workforce as a single entity but instead, treat each employee as a “workforce of one,” offering customized HR and talent management solutions. 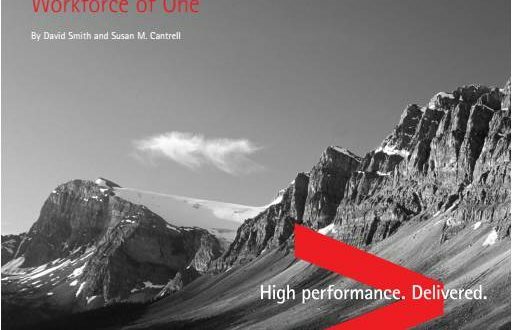 According to Accenture Strategy, while companies have excelled by treating customers as “markets of one”-offering them personalized buying experiences. The concept of customization and the technology have fueled the rise of some of Amazon (book and other product recommendations just for you) and Netflix (movies that fit your profile), to name just a few. However in managing talent, still use one-size-fits-all HR practices, and this approach is preventing organizations from attracting, retaining, and leveraging top talent. Yet business and workforce trends are pushing organizations to break out of the old standard employment deal. People now expect—even demand—customization in the workplace because they have experienced it in their everyday lives as consumers. Meanwhile, changing demographics have made workforces more diverse in terms of age, gender and ethnicity, as well as life aspirations, cultural norms and core values. And with the rise of more complex knowledge work, jobs are becoming increasingly difficult to standardize, and companies are struggling to find enough qualified workers. All this will make today’s generic, one-size-fits-all people practices soon obsolete. After all, when people practices are not personalized for employees, their performance, engagement and productivity can suffer. 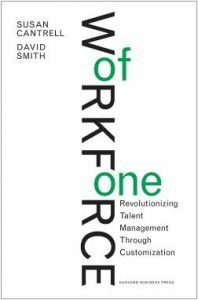 In Workforce of One, Susan Cantrell and David Smith show how exceptional companies are tailoring work experiences to employees’ talents and interests-customizing job duties, training, recognition, and even compensation, work schedules, and performance appraisals. Their reward? Lower turnover, greater productivity, improved profit margins. Drawing on extensive proprietary research, the authors explain how to combine aspects of all four strategies to address your organization’s unique needs. Improving workforce performance through customized work experiences is the holy grail of the HR function. This book shows you how the workforce-of-one approach positions your company to win-while transforming your HR team into a strategic powerhouse. Standardization of such practices has helped companies to achieve important goals including consistency, efficiency and fairness and to gain a global view of their people.In today’s age of talent war organizations will also need to boost the performance of an increasingly diverse, knowledge-oriented workforce. To achieve this goal, leading companies are applying the same business logic to their employees that made customization so successful with customers. 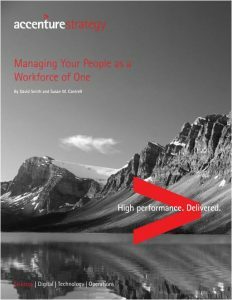 With a workforce-of-one approach, organizations can bring customization into the open by adopting practices, policies and standards that make customization available to all employees and easy to manage. 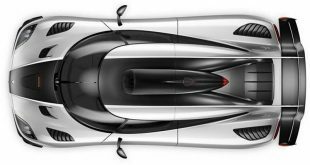 The key is to customize within a structured, rules-based framework that allows for flexibility. Adopt a new mandate. In the future, HR organizations’ mandate will be to understand and serve employees with highly relevant offerings that improve their engagement, motivation, retention and performance. Develop new skills. HR professionals will need to develop the kinds of skills that marketers use to excel at customization, such as co-creation. Implement new roles and organizational structures. HR may have a dedicated analytics group, as well as people and resources focused on coaching employees in how to make the most of their customized work experiences. In addition, HR might need to set up new organizational structures that break down internal functional silos; doing this may mean it will have to change its own organizational structures. Susan M. Cantrell is a research fellow at the Accenture Institute for High Performance. Based in Philadelphia, Pennsylvania, Ms. Cantrell is the coauthor of Workforce of One: Revolutionizing Talent Management through Customization (Harvard Business Press, 2010). She has coauthored more than 30 articles or book chapters, including Elements of Successful Organizations (The Workforce Institute at Kronos, 2011). David Smith is senior managing director responsible for the Accenture Talent & Organization management consulting practice. He specializes in designing and developing talent and organization strategies and solutions for clients and has extensive international experience working with some of the world’s largest global companies, including a number of Fortune 500 companies. Mr. Smith, who is based in Hartford, Connecticut, is a frequent speaker at industry conferences and events, has published numerous articles and papers, has contributed his viewpoints on the business impact of talent to many media and industry publications, and is the coauthor of Workforce of One: Revolutionizing Talent Management through Customization (Harvard Business Press, 2010). How is the Gender Gap affecting the recruitment industry?